I carry a North Face rain shell on all winter events and any warm events where rain is in the forecast. I’ve had it for 10 years and it is on its last leg. This looks like it might be the replacement. That said, my biggest hope is that this is a shell and not a jacket that is going to make me hot. If I need warmth, I’ll add layers under the jacket like the SWEET half-zip that I recently picked up and LOVE. But, from this jacket, I just want rain protection. That said, here’s Jason and his son testing out two versions. 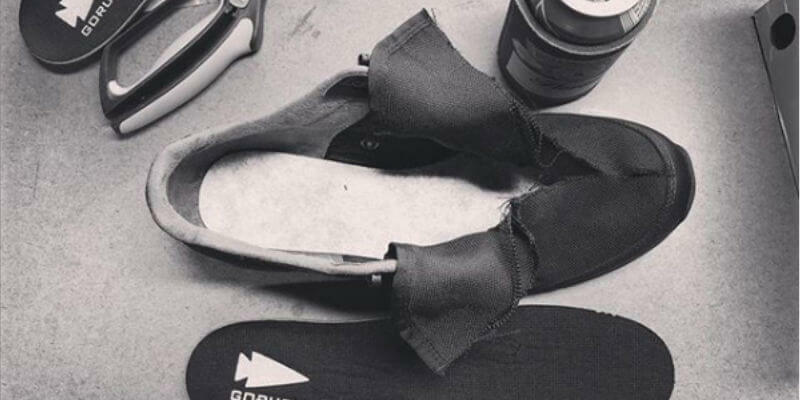 Hard to tell exactly what’s going on here, but it “looks” like this is a prototype for a sneaker. Personally, I’d love this. If temps are over 45, I ruck in shorts. Would much rather be out in shoes than boots. This is very intriguing. Everyon loves the MACV-1 Rucking Boots. Since they were released, people have been asking for an 8″ version. Well, here you go. These will be available in black and coyote. I’m not really sure what this could mean. Are these going to be products that the ladies are getting that the fellas don’t get? I don’t know. But, a “whole new line” is in the works for GORUCK Women’s Apparel. Special thanks to Emily on this one. Finally, you all can stop yelling at Strava to add “Rucking” as an option. 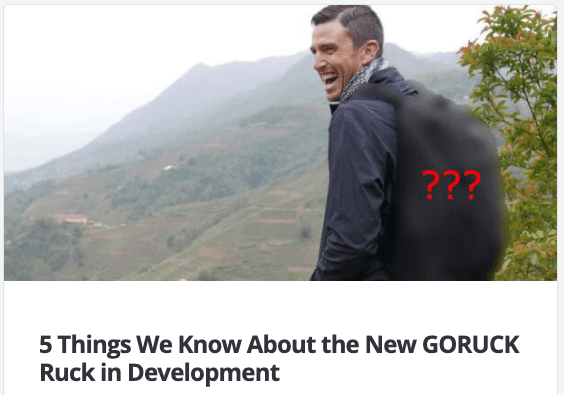 GORUCK appears to be building their own rucking app from the ground up. Which, I guess, means I should give up my secret dreams to build a rucking app. 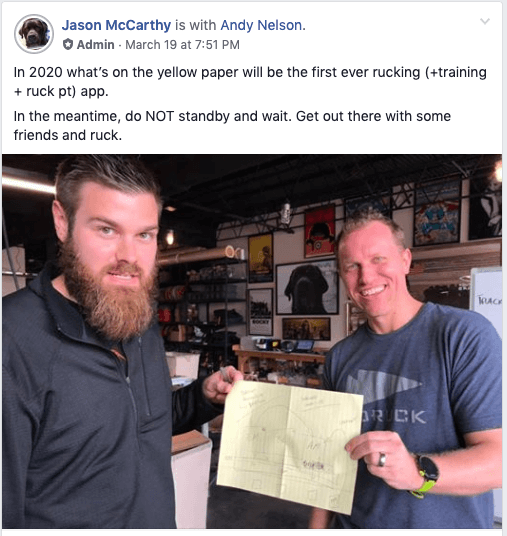 We’ve covered this one in more detail in this post, but there is some sort of ruck in development that will be geared to those who are just interested in rucking. Here’s all we know about that one. Have you picked up on anything else GORUCK has been hinting at? Drop your leads in the comments below. I'm just a normal guy with the worst hobby ever. I have one kidney, 3 kids, an amazing wife. I work at a church in Richmond, workout at a crossfit gym in Richmond, and get worked-over by bunch of little kids that I coach in soccer. I bought the domain ruck.beer because it is awesome. I also run a GORUCK training site, Ruck.Training, Ruck.World, a satarical look at GORUCK, and Rucking.com, that focuses solely on the sport of Rucking. Shoes & 8″!!!! APP!!!!!! YES! Shoes with better tread for west coast conditions? Check out this great GORUCK Training wesbite. Want a coupon? There's a challenge for that. Join our mailing list to receive the latest news and updates from Ruck.Beer. 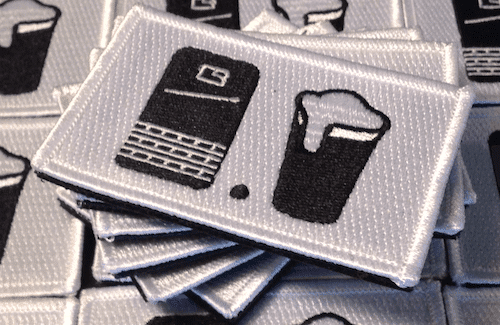 At the end of April, we'll give away 10 free patches. QUICK! Check your inbox and confirm subscription to enter.